I sit in coffee shops and I eat at a kitchen table and I go to sleep at night in a bed that’s in a house, not a bus. In the spaces between those times, and occasionally in a misplaced dream, I think about how on our recent cross-country trip the bus galloped over a bridge or bounced up and down after cresting a wave in the road. I didn’t have to think long. In regards to yesterday’s desire to hit the road, the answer is easy: avoidance. I want to drive away from my worries and my insecurities and this incorrigible waiting. I want to pull into a well-lit Walmart, park the big blue bus we traveled in, and write at the small table with Maile while the kids fall asleep in their bunks. I want to drive on roads I’ve never driven, wind along gorges that make me feel queasy from the sheer drop to either side, and forget this present reality. Perhaps there are at least two reasons for traveling: there’s this one that Steinbeck talks about, the one I admit to feeling right now if I’m honest with myself: a wanting to move away, not to something, but away from something. Yet there is another reason to hit the road, one that has perhaps a dash of avoidance but at its heart is so much more. I know this second reason exists because it is the reason we went on our trip in February – I didn’t feel the need to escape from anything back then. There was no dire financial situation to run from, no grating relationships or unbearable waiting. We were simply in the middle of a good life, and we wanted to take an adventure, and perhaps make life even better. We wanted to prove that we could do it, in spite of being afraid. And it’s for that reason I am going to Sri Lanka in one week: for the going, not for the avoiding or the not-staying. I want to see things I’ve never seen and meet people I’ve only heard about and taste foods that will knock my socks off. Part of me is terribly afraid – not of the time change or the food or any mosquito-harboring disease I might get. Not of writer’s block or plane crashes. No, I’m terribly afraid of the change that might be wrought in me. I’m scared of what seeing people in such dire circumstances will do to my world view or my Self. I wonder. Of all the reasons there are for going, perhaps being terribly afraid is one of the best. 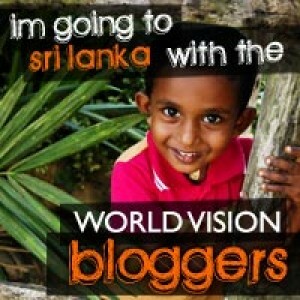 In one week I’ll be leaving for Sri Lanka, and I’ll blog about the trip for World Vision as I witness for myself the way that child sponsorship changes lives. I’d love for you to join me – all you have to do is show up here from August 25th through August 30th. You go for all the right reasons, Shawn. Praying for you all as you travel – realized today that I follow (or know) 5 of the 7 bloggers in this group. Went to seminary with Tony Jones many years ago, once followed Hollywood Housewife and do follow you, Joy and MPT. May God bless each of you as you meet both the harsher realities of life in Sri Lanka AND the amazing presence of grace and the goodness of God right in the middle of it all. Definitely one of the best reasons, Shawn. No doubt about it. That’s exactly it. Before going to Africa for the first time, I felt like I went through a period of grieving — kind of like a loss of innocence, or loss of ignorance really. I knew I needed to go, was excited to go, wanted to take in all it had to offer, but I knew that I knew I could never be the same again after that. And though you never change like you think you will, you do come back changed. It’s the best reason to travel, and the best reason to push through the fear. Thanks for articulating that here. Looking forward to following your trip as I prepare for one of my own.